The first month of 2019 found drugmakers again increasing list prices on some of their most important medicines. The frequency and degree of those hikes, however, appear somewhat diminished compared to years past, an analysis by the investment bank Raymond James concluded. The average price increase was about 6%, compared to roughly 8% last year and 12% in 2014, the report found. Drugmakers appear more sensitive to political and public criticism in the current environment, analyst Elliot Wilbur wrote in a Monday note to investors. Some pharmas continued to push prices up at rates approaching double digits, a mark much of the industry has adopted as an upper bound for their planned increases. In 2014, by contrast, five companies — including Merck & Co. and Bristol-Myers Squibb — enacted double digit price increases on a weighted sales basis, Raymond James calculated. Historically, about 40% of the industry’s price hikes for the year occur in January, the bank’s report found, making the month an important barometer of pricing for the year ahead. With fresh data from last month in hand, Raymond James’ Wilbur predicted a new normal of mid-single digit hikes, with the potential for future moves to more closely track inflation levels. “The days of double-digit price increases are long gone and the new pricing model has increasingly tended toward a series of modestly lower mid-single digit increases,” Wilbur wrote. The analysis tracked roughly 6,500 branded drugs by wholesale acquisition cost broken down by individual product packaging configurations. Measured year over year, the total number of price increases dropped from 2,383 last January to 2,103 last month. While that figure’s meaning is diluted somewhat by including multiple variations of a single drug, the findings correspond with recent moves by drugmakers to take a more selective approach to pricing. Weighted price increase figures take into account a drug’s sales over the past 12 months, in effect tying the increases to how much revenue a product has earned. The bank’s findings come as the Iqvia Institute for Human Data Science recently forecasted a similar future for pharmaceutical pricing over the next few years. The group recently predicted invoice price growth will range between 4% and 7% in the near term. Invoice prices, which largely track with list prices, are what a hospital or pharmacy pays to drug distributors and can include some discounts, such as for volume. Pharmas often argue that net prices, accounting for rebates, paint a clearer picture of drug pricing than do list prices — messaging that Health and Human Services Secretary Alex Azar has recently pushed back against. The Iqvia report will likely give drugmakers more ammunition to make their case, however, forecasting net price growth for protected brands in the next five years to be between 0% and 3%. 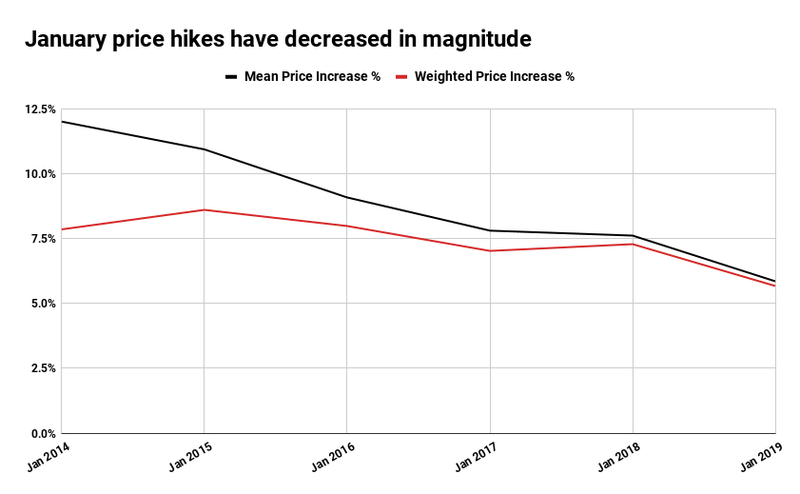 Last year was the first time in recent years that net price growth fell below inflation levels as measured by consumer prices, the report found.